The RD8300 is the most advanced paperless recording system available. It incorporates the latest in measurement, communication, interface and processing technologies to deliver unmatched performance for your data acquisition application. The RD8300 series utilizes a high contrast 142 mm (5.6") color Active Matrix TFT LCD display with a rugged touch screen. Use a finger or the onboard stylus, if you prefer, to perform data entry and system navigation. The front panel is also fully compliant to IP65 for use in dusty or wet areas. An intuitive icon driven menu system guides the user through easy to follow setup and control screens. The display builder feature makes setting up custom screens extremely simple. Design up to 50 custom displays containing various combinations of indicator types such as horizontal and vertical bar graphs, large and small digital indicators and horizontal or vertical trends. On-screen help is available throughout the menu system to assist you during setup and use. When it comes to storing data, the RD8300 is extremely flexible. Data can be stored to the non-volatile internal flash RAM or any of the available storage drives including CompactFlash and USB provided there is media present. Programmable record start and stop times allow the user to start and stop recording at predetermined intervals. Data may also be stored to a remote PC via Ethernet using the optional Exhibitor Software. In addition, the built in OPC Server allows any OPC compliant software client to connect to, communicate with and retrieve data. The RD8300 utilizes many layers of security to protect the integrity of your stored data. All data is stored in an encrypted binary format which prevents data tampering and maximizes compression. The front access media door is lockable to prevent unauthorized access to the internal removable storage media. There are 3 levels of password protection to prevent unauthorized entry into critical recorder function menus. To ensure that data files are completely error free the RD8300 has a built-in rechargeable Nickel Metal Hydride battery backup system that constantly monitors the incoming power source. In the event of a power loss or power dip, the RD8300 seamlessly switches over to the internal power and begins a safe and controlled system shutdown. When power is restored the recorder immediately returns to the last state of operation. This guarantees that data files will never be corrupted by unexpected power conditions. Powerful Math Package The onboard math package is extremely powerful. It allows the user to input complex polynomial equations using constants, custom functions and variable inputs obtained from live channels. The resultant information can be displayed and recorded as a real time channel. Using the intuitive calculated channel setup menu the user enters in the formula and can perform a test to make sure the formula is accurate. Unique Sounds Unique .wav files may be uploaded and played through the internal speaker to alert of specific types of alarms. Use any .wav file, even customize your own spoken word announcements. In areas where there is a high level of ambient noise the alarm .wav files can be output to a P.A. system or amplified speakers via the rear mounted audio connector. Each alarm setpoint can have a unique sound file associated with it. In the alarm setup menu simply select the .wav file you want to play when the alarm is active. Remote Control The remote control feature extends the graphic user interface of the RD8300 Series directly onto your local PC. Use remote control and your desktop PC’s mouse and keyboard to view real time data, change settings, start and stop recording or virtually anything else you can do with the recorders touch screen. Across the plant or across the planet, remote control empowers you with virtual presence. Using the record setup menu, the user can select which channels to record, the sample storage rate, whether to record alarms and/or events, and the start/stop time and date for the record session. The location of the data file is selected in this menu along with the data file name. The user can also configure the unit to start or stop recording on an alarm level or an externally triggered input. Exhibitor Software Network Overview Exhibitor Software is an extremely powerful set of tools that compliments the RD8300 and other OPC compliant devices. Incorporating functions to simplify data management via searching, reviewing, printing, or exporting historic data, Exhibitor Software allows real-time monitoring and recording independently as well, while historic recording is not affected. Also featured is the OPC Client which enables the user to build custom screens selecting various display elements and data from multiple OPC Servers, including devices other than RD8300’s. (Windows XP/2000 Compatible). Customizable Real-Time View Use Exhibitors design page features to create custom real time display projects that can be saved and recalled with a click of the mouse. 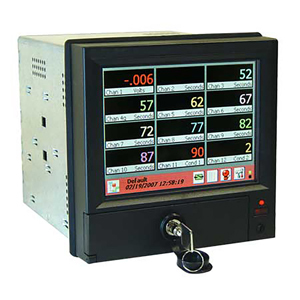 Create bar graphs, digital panel meters, thermometers or trend screens from live data coming from any RD8300 or other OPC compliant device accessible on the network. Using the OPC device manager, Exhibitor allows you to connect to OPC servers anywhere there is a network connection. A user definable list of data is then accessible by the design page, where customized real-time displays are built using the user friendly graphic user interface. To place items, simply point, clicks, and drags. Save your project for future use and the next time it is opened all servers are automatically connected and data will begin displaying immediately. Go one step further, and record real time data to your PC. Graphical Review The composite graphical view can display all inputs and calculated data from a particular recording session. The user is able to manipulate the graph to make it easy to see interaction between recorded channels, turn channels off and on, change color schemes, expand, compress, zoom, and print. Individual channels can be displayed for detailed analysis. There is a summary function for the individual channels which provides minimum, maximum, averages and time and date for the records. The same analysis tools used for the multi-channel graph are used to scroll through data, zoom, review and expand the single channel graphs. Tabular Data Review The data table view displays recorded data in tabular format. All recorded information within a file can be viewed or deselected along with time stamps. Using the one click export feature, the table can be exported to Excel™ in its entirety or in portions. The data table and graph can be synchronized so that they are interactive during analysis of records. Double clicking a value in the data table will automatically bring you to the graph page with that value and time highlighted. Move the cursor over the point and detailed information is provided. Also available are separate alarm, event, and memo review screens. Memo review lists all on-screen annotations in a record.